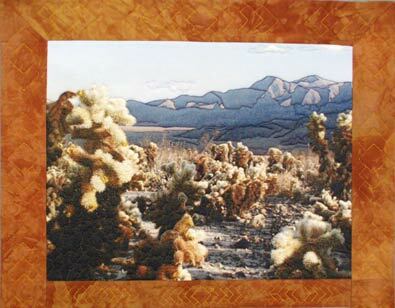 18" w. x 52" h.
A trip to the Cholla CactusGarden in Joshua Tree National Park in December, 2002, and the Surface Design Association 2003 Member Challenge, "Up Close and Far Away" came together to inspire this piece. Four views of teddy bear cholla were heavily thread painted so that the piece is as interesting on the back as on the front. The images were transferred to polyester crepe with disperse dye polyester computer transfer technique, which I use on most of my work. 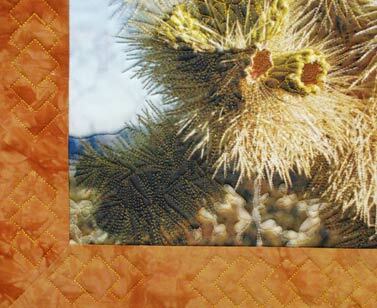 The borders are embroidered with a southwestern quilting pattern that I've used on a number of pieces. Copyright 2003 by Barbara Barrick McKie, all rights reserved.